There are 39 Assisted Living Facilities in the Delray Beach area, with 10 in Delray Beach and 29 nearby. The average cost of assisted living in Delray Beach is $3,659 per month. This is higher than the national median of $3,346. Cheaper nearby regions include Boynton Beach with an average starting cost of $2,692. To help you with your search, browse the 358 reviews below for assisted living facilities in Delray Beach. On average, consumers rate assisted living in Delray Beach 4.2 out of 5 stars. Better rated regions include Parkland with an average rating of 4.9 out of 5 stars. Caring.com has helped 8 families in Delray Beach find high-quality senior care. To speak with one of our Family Advisors about assisted living options and costs in Delray Beach, call (855) 863-8283. Delray Beach is a coastal city located in Palm Beach County. There are ten assisted living facilities in Delray Beach and an additional 47 in nearby communities, including Boca Raton, Boynton Beach and Lantana. Florida has four types of licenses for assisted living facilities (ALFs): a standard license, and three specialty licenses held by facilities with additional resources that enable seniors to age in place. Licensing is administered by the Agency for Health Care Administration. The Delray Beach area is home to world-class medical facilities, including the Delray Medical Center and Bethesda Hospital East, in the event of medical emergencies or illness. Delray Beach has 235 days of sunshine each year, making it a good choice for seniors who enjoy the outdoors. High temperatures in summer average about 89 degrees, and winter low temperatures average around 58. Delray Beach does get about 56 inches of rain each year, which is above the national average, but the town doesn't get any snow. Florida has no state income tax, so seniors keep all their income from Social Security, pensions and retirement accounts. Sales tax is on par with the national average, and some items, including groceries and medication, are exempt. The overall cost of living in Delray Beach is about the same as the national average. However, the cost of groceries, health care and transportation are slightly higher than both the national and state averages. Delray Beach is serviced by Palm Beach County's Palm Tran buses. Palm Tran has both a Seniors in Motion program, which includes reduced fares for people older than 65, and Palm Tran Connection, a door-to-door service for eligible riders. Additionally, the city of Delray Beach operates a free shuttle service, the Downtown Roundabout Trolley, which serves the downtown area. Delray Beach has a crime rate of 49 per 1000 residents. This is higher than 87 percent of other Florida communities, and one of the highest crime rates in the United States. The violent crime rate is 5.8, compared to the Florida statewide average of 4.3. The property crime rate is 42.72, over 40 percent higher than the Florida average of 26.87. Assisted Living costs in Delray Beach start around $3,659 per month on average, while the nationwide average cost of assisted living is $4,000 per month, according to the latest figures from Genworth’s Cost of Care Survey. It’s important to note that assisted living rates in Delray Beach and the surrounding suburbs can vary widely based on factors such as location, the level of care needed, apartment size and the types of amenities offered at each community. 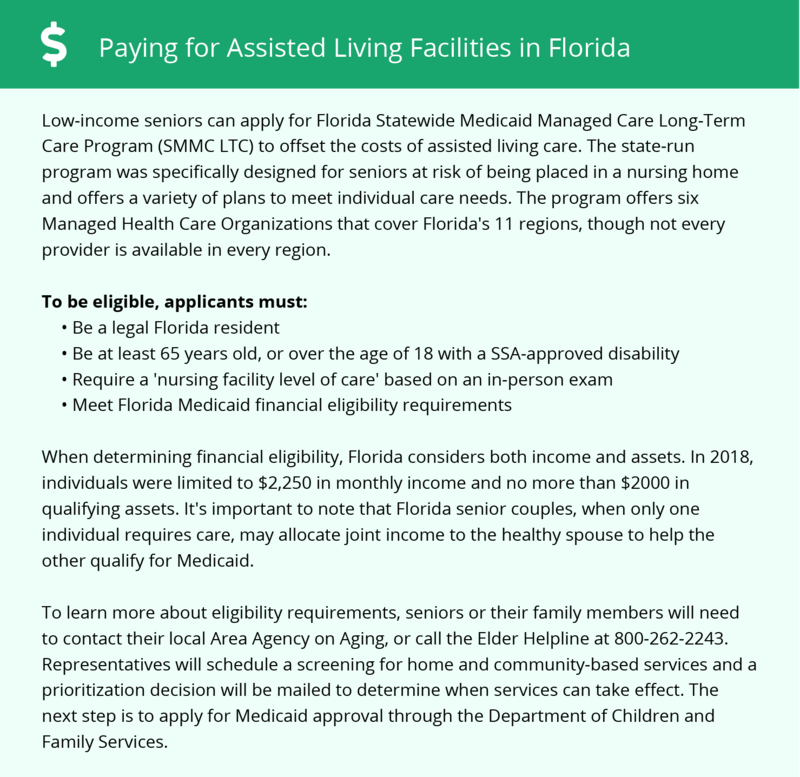 Financial assistance may be available to residents of assisted living facilities through the Medicaid Long Term Care Program and the Assistive Care Services waiver. Florida also has an Optional State Supplement for residents receiving income from SSI. To see a list of free assisted living resources in Delray Beach, please visit our Assisted Living in Florida page. Delray Beach-area assisted living communities must adhere to the comprehensive set of state laws and regulations that all assisted living communities in Florida are required to follow. Visit our Assisted Living in Florida page for more information about these laws.